Join Orlando Chamber Choir for a day to sing infectiously joyful masterpieces of the New World baroque! The programme includes De Padilla's exciting Missa Ego flos campi and exhilarating works by De Araujo, De Zéspedes and Capillas. James Weeks will direct the toe-tapping Latin American rhythms, assisted by a fast-footed organist, and the day will end with an informal and festive performance at St Mary-le-Bow. 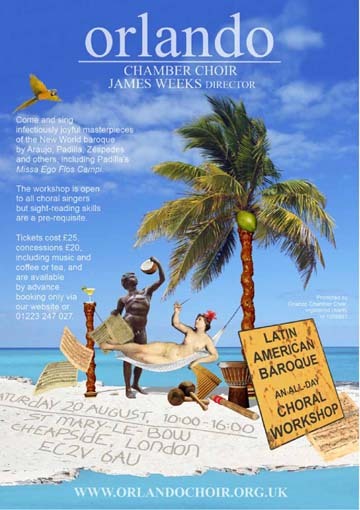 A one-day musical beach holiday that will baroque you off your feet!